Take a flight to Nampula and from here, a 4 hour drive brings you to Nuarro, passing through small Macua villages which will give you a great sense of everyday life in Mozambique. Nuarro is situated in an area of pristine beauty, between Pemba and Ilha de Mozambique, at the point where Nanatha Bay ends. Formed from ancient coral rock which has eroded over time, Nuarro offers tropical private beaches, world class diving, unspoiled bush. There are magnificent bay views to the North and bush view and Baobab forest to the south and lush dune vegetation creates a very private sanctuary. The closeness of the continental shelf and undiscovered sites make Nuarro a perfect diving location. 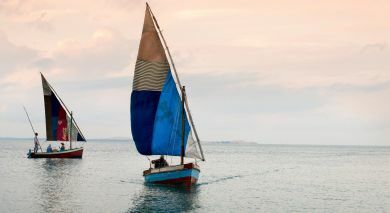 Enjoy activities such as: diving, snorkelling, kayaking, dhow trips, village tour, bush trails, fishing, whale watching, sailing, sundowner cruise in traditional wooden dhows and a day trip to Ilha de Mozambique. Ilha de Mozambique is a small island off the north coast of Mozambique which was declared a World Heritage Site by UNESCO in 1991. True to this designation the island is a melting pot of ancient history and diverse cultures spanning several centuries. Besides Portuguese and Hindu influences the island has a rich Arabic culture and inhabitants of the island still trade in silver and beads. Although a bit run down, the ancient buildings of Ilha de Mozambique are being restored to be a befitting witness to its rich history. A city tour is best enjoyed on foot and allows the island’s guests to enjoy places of interest like St. Paul’s Palace, the Museum of Sacred Art and the Fortress of St. Sebastian as a cultural experience of this ancient island of history and culture.